Chocolate and peanut butter are always a winning combination. 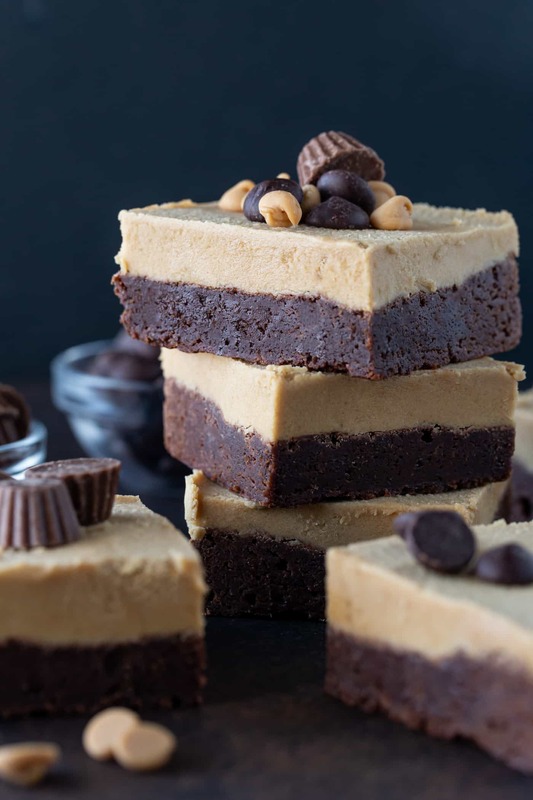 But these Peanut Butter Cookie Dough Brownies made with chewy chocolate brownies and a thick layer of peanut butter cookie dough on top hit it out of the park. 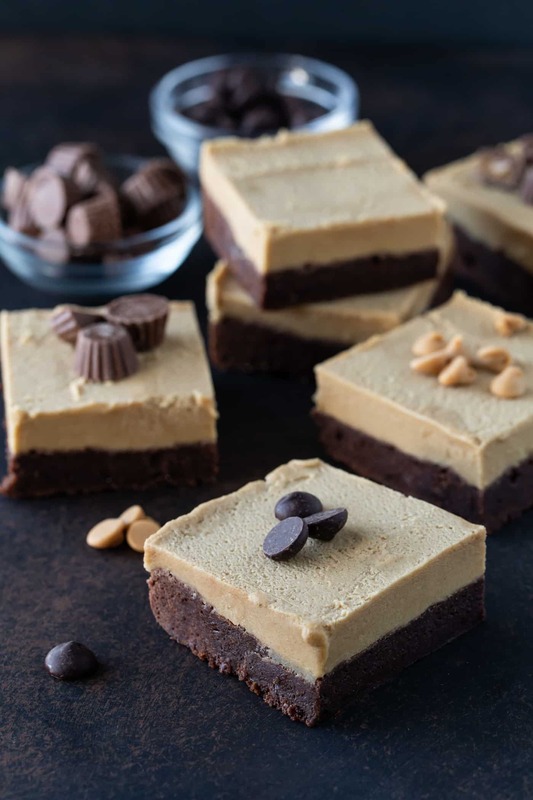 Calling all chocolate and peanut butter lovers, these Peanut Butter Cookie Dough Brownies have your name written ALL over them. Because really it’s a combination that you can’t go wrong with. Ever. Am I right or am I right? 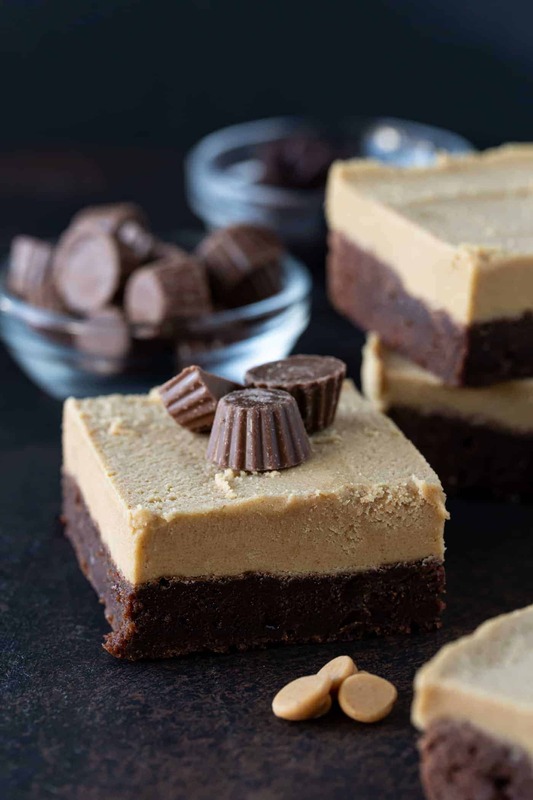 Chewy chocolate brownies layered with peanut butter cookie dough? Oh. My. Goodness. If you don’t agree with me as to heavenly these are, I’m not sure we can be friends. I like them THAT much. My base layer is one of Smitten Kitchen’s brownie recipes. (Why mess with success, right?) But then I couldn’t leave well enough alone and added a layer of peanut butter cookie dough on top of the fudgey brownie. It’s chocolate peanut butter nirvana. Don’t worry, you can thank me later. But these brownies have raw cookie dough, is that safe to eat? Yes! It’s safe because the peanut butter cookie dough doesn’t have raw eggs in it. But it does have raw flour and the FDA recommends you bake the flour before you eat it. Bake flour? How in the world do I bake flour? It’s super easy! Simply bake the amount of flour you need for your recipe at 350 degrees for about 5 minutes. Allow it to cool completely before adding to the other cookie dough ingredients. The idea to bake your flour is similar to pasteurized eggs. A short spin in the oven and exposure to high heat kills any bacteria that might be lurking in your flour thus making eating spoonfuls of this cookie dough from the bowl safe. Easy peasy, right? So what are you waiting for? Judging by how quickly they disappeared in my house, you might as well start with a double batch. They’re that good. Bars are always a great dessert for any gathering! Check out some of our other favorites! 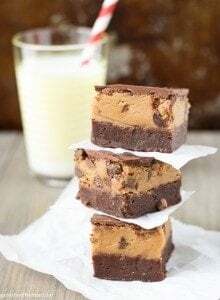 Chewy Brownies layered with peanut butter chocolate chip cookie dough. Preheat the oven to 350 degrees. Line a 9x9 square baking dish with parchment paper and set aside. In a microwave safe bowl, combine the unsweetened chocolate and butter. Microwave until melted, stirring every 30 seconds. Cool mixture slightly. In a medium bowl pour melted chocolate mixture and add sugar. Stir in eggs one at a time. Add vanilla and mix. Last, add the flour and stir until just combined. Do not over mix. Pour batter into prepared pan and bake for 25-30 minutes or until toothpick comes out with just a few crumbs clinging to it. Let cool thoroughly. In the bowl of a stand mixer, add butter and brown sugar and beat until light and fluffy (3-4 minutes). Add Milk and peanut butter and mix until combined. Add flour and mix until incorporated. Stir in chocolate chips by hand. Evenly spread cookie dough over cooled brownies. Oh my word this looks incredible. Grab me a cup of coffee and I”m ready to dig in! These look divine! Love PB and chocolate! Wow! Bars that involve chocolate, pb AND cookie dough are a total winner with me! Pinned! Thanks for the pin, Kelli! I completely agree with the winning combination-I can never say no to this one. Oh my! These look deliciously decadent! These would not last long at our house! 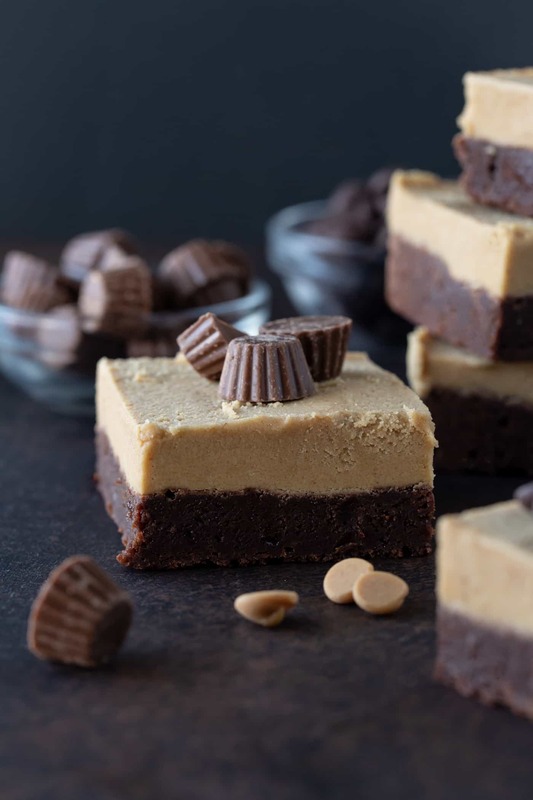 You’ve got all my favorites in this recipe: chocolate, peanut butter and cookie dough! Fantastic! As far as I’m concerned, peanut butter and chocolate is the only flavor combo I’d ever need in life. These look insanely delicious! Everything about these screams yes to me!!! LOVE these!!! oh my gawshhhhh. So in love. And yes, utterly heavenly. They were definitely tasty, a new family favorite! Love everything about these brownies! These look incredible! Obsessed is right! 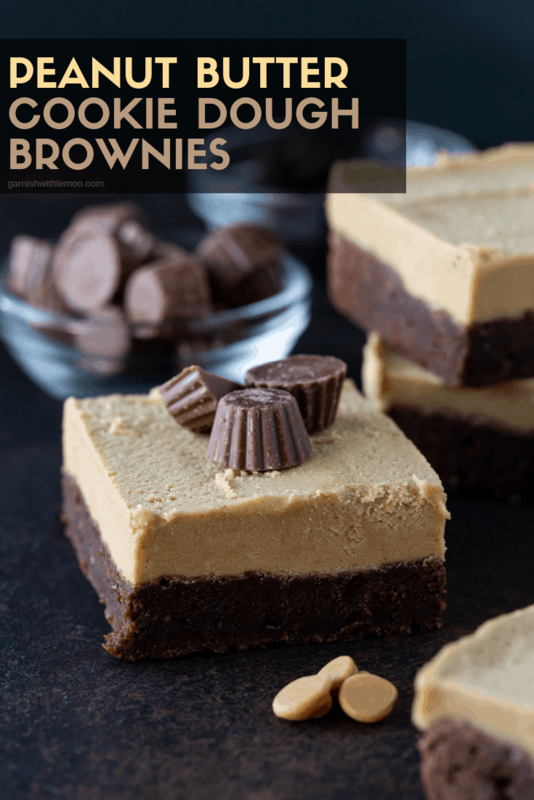 Chocolate and peanut butter are the best dessert flavors and these brownies might just be the ULTIMATE!! These look deadly in a good way!! I love PB in anything! Oh my god. I can’t even. Peanut butter – yes! Chocolate – yes, YES! Cookie dough – [email protected]^k YES!!! You are my new favorite person right now. Cant talk now. Must get to store for ingredients! Stat!